I absolutely adore cinnamon rolls, really cinnamon anything! One of the things I missed the most since going gluten-free was cinnamon rolls. I was looking for gluten-free cinnamon roll and cinnamon buns recipes online and they seemed so labor intensive. These recipes had lots of steps and took lots of time. This busy mama of four does not have time for that! 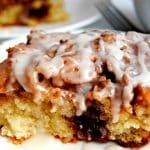 So when I found this recipe for cinnamon roll cake on Chef In Training‘s blog I was so excited. I found that the cinnamon roll cake was easy to modify to be gluten-free. A lot of gluten-free cooking is finding ways to modify your favorite recipes to be gluten-free. I have also included a dairy-free option to my gluten-free cinnamon roll cake recipe. My husband, my youngest son, and I are all dairy-free. I promise it is just as delicious made with the dairy-free butter and dairy-free milk. For this recipe, I like to bake with almond or cashew milk and Smart Balance or Earth Balance butter. So, you too can enjoy a gluten-free and dairy-free cinnamon roll cake. Gluten-free cinnamon rolls can be hard to recreate. 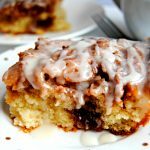 With this gluten-free cinnamon roll cake recipe, you get all of the flavors of cinnamon rolls and cinnamon buns without all of the work! This is not your average cinnamon cake. It has both the texture and the taste of a gooey cinnamon roll. Seriously this is one of my favorite gluten-free cakes! Cinnamon rolls are not just for breakfast anymore. Enjoy! 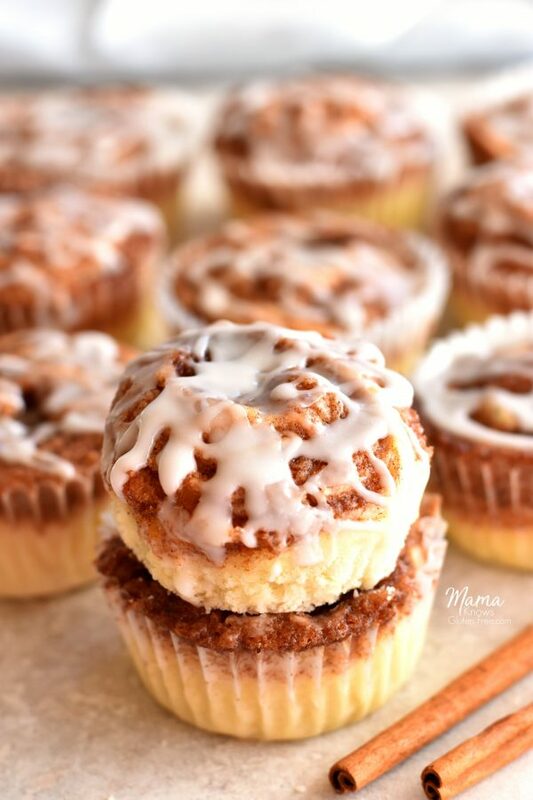 I also have also turned this amazing cake into a recipe for Gluten-Free Cinnamon Roll Muffins too! Try my some of my other gluten-free dessert and gluten-free breakfast recipes. Recipe adapted to be gluten-free from the Cinnamon Roll Cake recipe from Grin and Bake It (it’s not linked because the blog is no longer exists). I am so excited to have connected with you! I am just starting my gluten-free journey and it looks like I may be coming to your site quite often…so many yummy things here!! Yay! I’m so happy that we are connected. Thank you so much! Please let me know if I can help you in any way. These pictures are UNREAL and they sound so delicious. I wonder if I could mix up this recipe and make it vegan? Substitute eggs for apple sauce.. hmm wonder if they’d still come out as good as they look here! Thanks for the recipe. Thank you so much! I’ve never tried an egg free version, but I do use apple sauce in my gluten-free baking often to help with moisture. It would definitely be worth a try! If you try it please let me know how it turns out. Thanks! It’s one of my all-time favorite cakes. Thank you so much! I am right there with you. LOVE me some cinnamon roll. This looks delicious I cant wait to try this recipe out! Thanks! I know you are going to love it as much as I do. This sounds super delicious! Thanks for the recipe! Thank you! 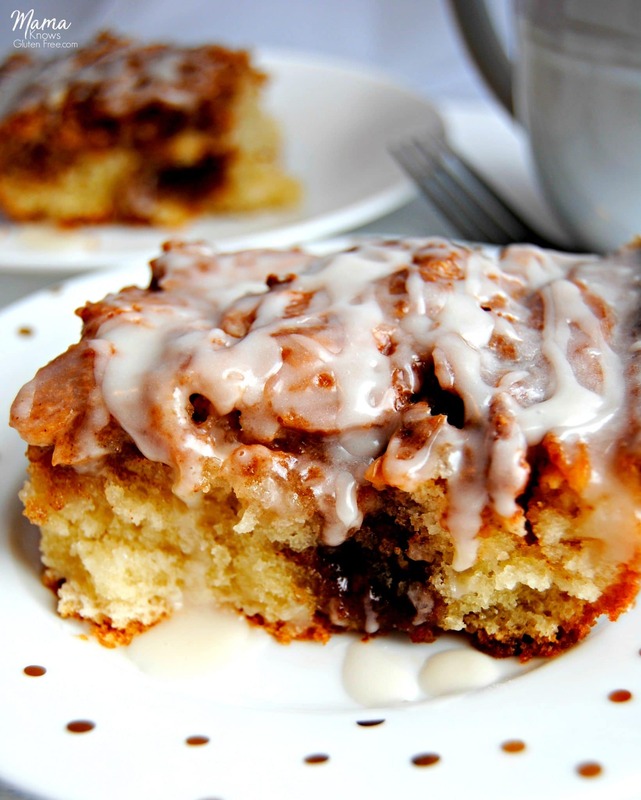 Wishing you a day filled gooey Cinnamon Roll Cake. Thank you! I love cooking, it’ one of my love languages. I hope you enjoy the Cinnamon Roll cake as much as I do. I am not gluten-free, but I am a lover of all things cinnamon! Looks delish! Thank you! 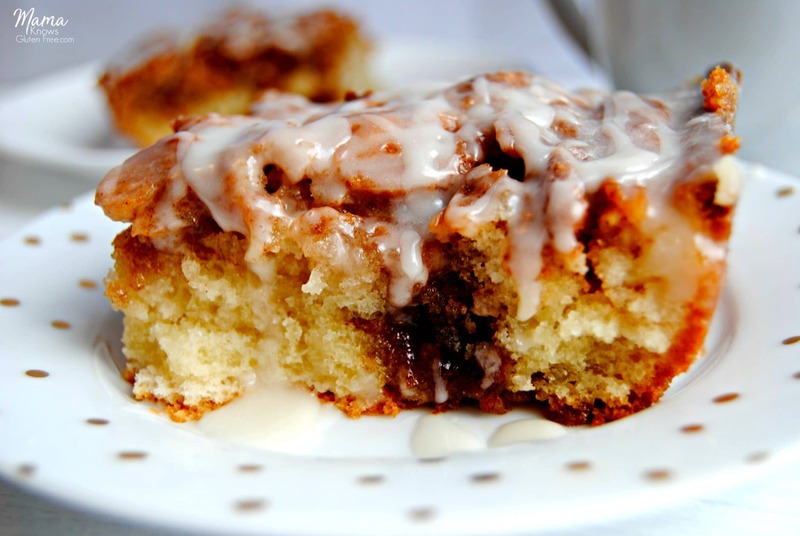 If you are a cinnamon lover you would love this cake! You could always make it with regular cake flour. Looks delicious, can’t wait to try. I love cinnamon rolls! I made this for our tailgate & it was delicious! No one knew it was gluten free either. Thanks! That makes my heart so happy! Thank you! ? Do you think you can make the batter the night before (let’s say Christmas Eve) and then put it together and bake it the following morning? Hi Rachel! I have never tried it, so I really can’t say. If you decide to try it, please let me know how it turns out. Sounds like an awesome idea! Hi Rachel. Did you end up making this the night before. How did it turn out? I just made this and it was a success! Thank you! I would like to serve the rest tomorrow – What is the best way to store this cake overnight? Fridge or room temperature? Hi Leah! I am so happy that you enjoyed the cinnamon roll cake. You can store the cake in an airtight container at room temperature. Just make this and had to trying it before serve it on Christmas morning? Best cake ever! Thanks for sharing! I swapped the eggs for flax eggs and used almond milk (hubby can’t have eggs or dairy) Still turn out perfect. Keeper for sure? Hi Ellen! I am so happy that you and your family enjoyed the cinnamon roll cake. It is my family’s favorite cake. I am so glad that you were able to use the flax eggs. I also use dairy-free milk when baking because my husband is also dairy-free. Thank you again for sharing you enjoyed the cake. It really made my day! My daughter was diagnosed on Christmas Eve at the age of 4 with Celiac Disease. Since then, it has been an ongoing challenge to find recipes that are delicious and that others will eat. I have a large family with 6, and unfortunately holiday time is a time when we have 44 people. Nobody but I will bring GF to our celebration times. I made this cinnamon roll cake for Christmas, and it was a huge hit! Thank you! Hi Kim, Thank you so much! This makes my heart so happy. I love sharing what I make for my family. I am so happy that you enjoyed the cinnamon roll cake. I don’t usually make things with flour. I was not great at it even before being diagnosed celiac. Lol Can you at least give some kind of idea on what type of gf flour to use please? Is Bob’s Red Mill 1 to 1 cup something that would work? From what I’ve seen others talk about, certain flours just don’t work for certain things. Thank you in advance! I have been craving anything cinnamon roll like for over 3 years! ? Hi Brandi! I usually use Gluten Free Mama’s almond flour blend with this cake. It has been out of stock lately, so I use Pillsbury gluten-free which is a cup for cup flour. I use the Pillsbury for just about everything. I buy it at Walmart for less than $5 for a 2 LB bag. I hope you enjoy the cake! It’s one of my favorites. If you try Bob’s Red Mill 1 to 1 baking flour, let us know how it turns out. I use this frequently because it is available in stores. Hi Deb! I have never tried Bob’s Red Mill 1 to 1, but a lot of my friends love it. I will have to see if I can find it in my local stores. Thanks for the recommendation. I absolutely love this recipe. I have made this 3 times in the past 2 months. Everyone loves it at work. It’s too much for my husband and I to eat so I have cut small squares,wrapped in Saran wrappped and placed in small freezer containers. I throw it in my lunch bag from the freezer and enjoy it as a lunch desert. Amazing! Thank you so much Jukie! This makes my heart so happy to hear.? I love sharing what I make for my family. I am so glad that you enjoyed it. Such a smart idea to freeze it! I just bought Pillsbury flour but haven’t used it till today. I tried this cake (halved the recipe, because new gluten free recipes and flour make me nervous). Baked it in a 8 x 8 glass pan. It is fantastic! I haven’t had a cinnamon roll in years but this tasted very much like one (and the smell, yum). I didn’t make glaze. Never liked it on my cinnamon rolls. Thank you for a wonderful recipe. I will make 9×13 pan the next time. I also forwarded this recipe to a few friends. Just found your blog so off to check out your other recipes. Thank you. Thank you so much for making this recipe! We have a Christmas tradition of having cinnamon rolls but my mom has been going through chemotherapy, so understandably, she wasn’t up to making them. I’ve had to take over kitchen duty and I’m pretty new to cooking and baking so i wanted something that would be that would be a good “replacement” and not be too difficult. Pretty sure a heavenly chorus rang out as soon as I took that first bite. I’ve been gluten free for over 10 years and I’ve had some really good foods but this was magical. My parents really liked it too. The only difference is I used Featherlight flour mix. I forget who makes that one so I hope I’m not violating any copyrights or anything. I will be making it with pillsbury tomorrow though as that’s what we have available currently. I am so glad that you enjoyed it Jen! That makes my heart so happy. Thank you so much! I have never tried Featherlight flour. I am so glad that it worked with the recipe. There are no copyrights when it comes to using a particular gluten-free flour. I just happen to really like and use the Pillsbury gluten-free flour. You are so welcome! I love sharing what I make for my family. I made this and just about cried because they were so good. I haven’t had a cinnamon roll in years and have missed them so much since going GF. These are absolutely to die for!!!! Thank you so much!! Made this today with Bob’s Red Mill 1:1 flour and it turned out great. It is delicious warm or cooled! My 8-year old celiac, who was a big fan of cinnamon rolls pre-diagnosis, loved it. Thank you so much for sharing–this recipe is a keeper! !